You know how I said I was done talking about homeschooling for the summer? I lied; I’m sorry! One thing I hadn’t yet nailed down was exactly how we were going to incorporate CC science, history, geography and timeline at home. I knew I wanted it to be the center of our curriculum this year, rather than something we do on the side or when we have free time, but I just wasn’t sure what it was going to look like. What I have felt, though, is conviction that we need to scale back the amount of busy work we’re doing to make time for this while still protecting the girls’ ample free time during the day. I’ve spent the last couple of weeks reading and researching and thinking through different ideas, and here’s what I’ve come up with so far. I’ve packaged these into one download for your convenience, but please know that I put these together with our family in mind rather than for a broader audience, so I encourage you to check out other printables available (I’ve included a list of resources at the end of the post) and figure out what works best for your family. You’ll also want to read through this post to understand how we’re using the various printables I’ve included. First, we’ll copy each week’s history sentence and illustrate it (pulling from our Draw and Write Through History books whenever applicable). Then, using the 5 W’s sheet, we’ll identify the who, what, where, when and why of the sentence. The why is a bit dialectic, so I’m not going to worry about getting too in depth with that one, and I left off how altogether for the same reason. As a side note, we’re also going to memorize Rudyard Kipling’s I Keep Six Honest Serving Men poem, which begins with “I keep six honest serving-men / (They taught me all I knew); / Their names are What and Why and When / And How and Where and Who,” so I am including a copy of that for their notebooks as well (and it’s included in the notebooking pack for you too!). Our approach for science will basically be the same — copying the sentence for the week and drawing an illustration. One of the benefits of a CC community is the built-in science and art projects each week so that you, as a parent, don’t have to do those at home. I had originally planned to replicate the CC experiments at home (and we will still be doing fine arts), but I’ve decided to wait until spring to try to add those. I’d rather them miss out on 12 weeks of science experiments than have us end up overwhelmed and ineffective in all areas because we’re trying to do too much! We plan to follow the approach outlined in The Core to practice tracing, copying and drawing various maps. We’ll start with the world map and focus on the placement of the continent blobs in relation to the various lines of latitude, and then move on to Europe (where the bulk of this year’s geography is located) and work on mastering the continent outline freehand. We may or may not worry about country outlines depending on how it goes. The second part of our approach will be identifying the weekly geography locations on a printed outline map using a numbered list. I’m going to have the girls write the weekly locations on the list and then add the corresponding numbers to show where they are on the map. 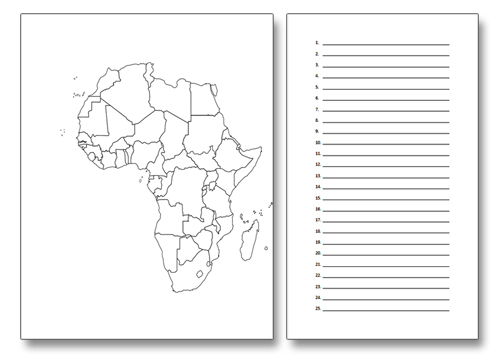 Notes: Because there are many free printable maps already available, I just printed out the maps I need from WorldAtlas.com rather than trying to create my own. I printed both the maps and geography lists on cardstock and then cut off the left margin of the list (at the faint grey line on the printable) so that I can tape the two pages together and have the list fold out beside the map rather than including it behind the map in our binder. Because there are so many European location, the geography lists go up to 75 across three pages, and I’m planning to attach those accordion-style so that we can mark all of the locations on one map. 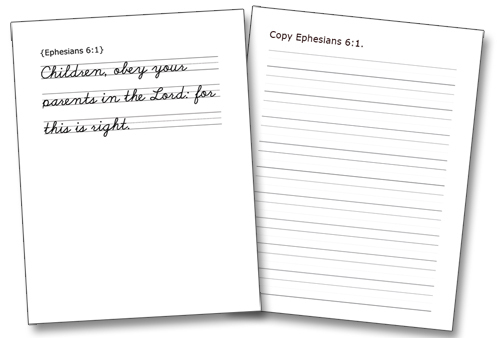 The girls are almost finished their Rhythm of Handwriting workbooks from Logic of English (which I love), and to continue practicing our cursive, we’re going to focus on copying this year’s Bible passage from Ephesians 6. Each day they’ll copy the verse of the week in cursive (so 4-5 times per week), which will help them memorize it, work on their copywork skills and practice handwriting. Unfortunately, because the cursive font I used includes a personal license only, I can’t include our master copy of the verses in cursive here on the site or in our printable download pack. However, if you email me and say something nice, then we’ll be friends, and I’ll be happy to share it with you via email as a friend! 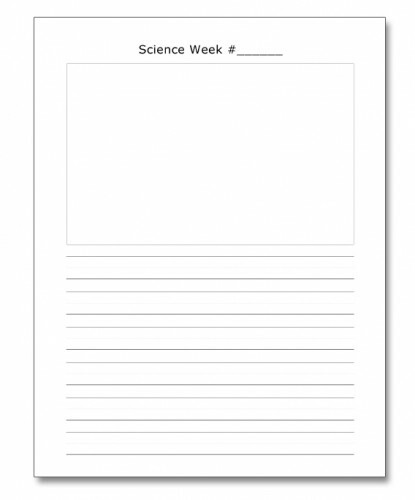 The notebooking pack does include the weekly blank copywork sheets. We will be adding the timeline card events and history sentences to our timeline, but we’ll be doing it on a smaller scale than last year’s attempt, when we tried to use a big paper timeline to record all of the events from history that we came across in our studies. That didn’t last very long for a number of reasons, one of which was the size and hassle of simply using the timeline (which I’d created on old-fashioned printer paper to create one very long continuous timeline). 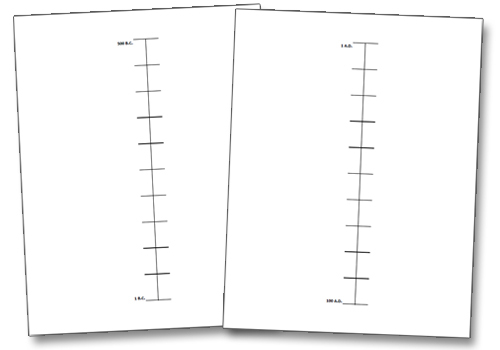 This year, I was originally planning to use the printable timeline from Half-a-Hundred Acre Woods, which is formatted horizontally so you can connect several pages together to really visualize the passage of time. However, I’ve come across a few vertical timelines recently, and I decided to try that approach so that the girls can actually write events horizontally next to the correct date. I also condensed ours a bit so that it “only” takes up 26 pages, with the first few millenia each spanning a single page (although I did break 1,000-500 B.C. and 500-0 B.C. into two pages) and then one century per page from 0 A.D. forward. Brandy’s timeline gets as detailed as one decade per page from the 1800s forward, so if you’d prefer that additional space for modern history, be sure to check hers out! Because the girls have started reading so much this summer, I also created a reading log for them to keep in their notebooks for the books they finish, and that’s included in the notebooking pack as well as a blank handwriting page for history or science sentences that run over the space given on those sheets! 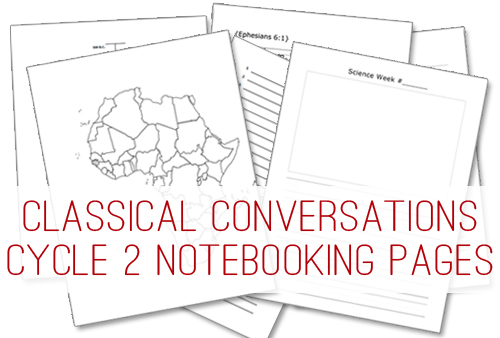 Click here to download the Classical Conversations Cycle 2 notebooking pages. And finally, be sure to check out the notebooking printables available at these various sites as well. Seeing what other people are doing really helped me figure out what we wanted to do this year, and there’s no reason you have to do exactly what someone else is doing rather than piece your own together! 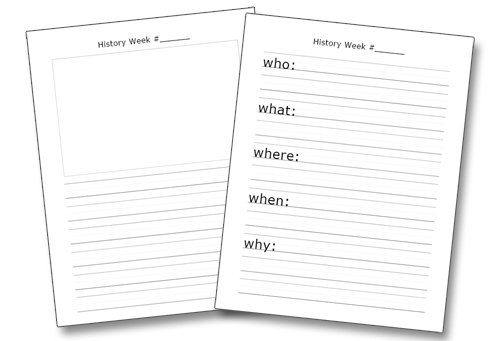 Do you use notebooking pages to reinforce memory work? How do you “do” CC at home? 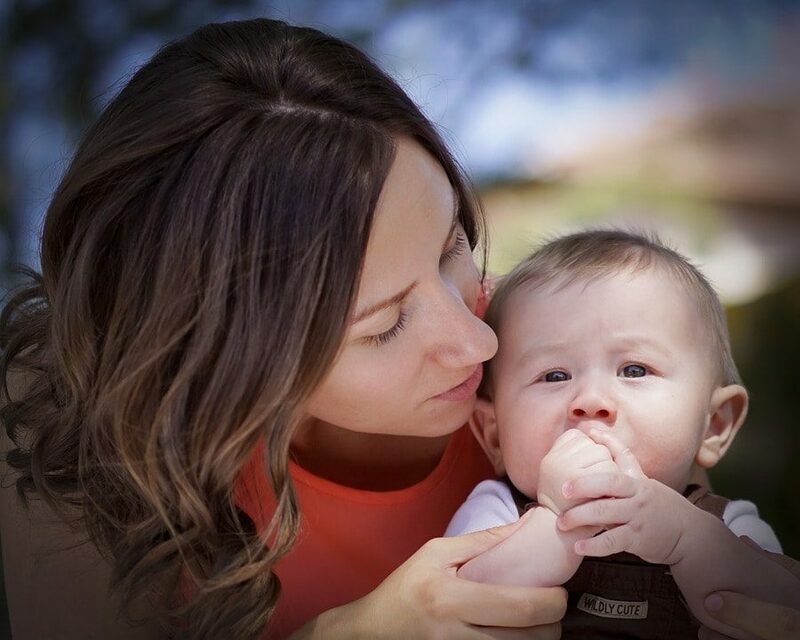 Previous PostUpdated Home Management Printables + a Special Coupon Code! Hi, Mandi. Will you have CC Cycle 3 printable available? We so enjoyed your Cycle 2 notebooking pages. Hi Raquel! The set now includes the non-cycle specific printables without the Bible verse copywork pages (there is a blank handwriting page in there now), but at this time I’m not planning to do the Bible verses.